The Blue-fronted Amazon (Amazona aestiva Linnaeus, 1758), in German Blaustirnamazone, in French, Amazone à front bleu, in Spanish, Amazona de frente azul, is an autochthonous parrot of the Neotropical eco-zoogeographic area, belonging to the order of the Psittaciforms (Psittaciformes), family Psittacids (Psittacidae), tribe Arini (Arinae), for some zoologists that of the Arinae is the subfamily, genus Amazon (Amazona). The systematics of this nominal species is still now subject of debates about the real number of subspecies in which it should be subdivided. Actually, for instance, the yellow belt present on the wings, a character which is utilized for distinguishing the subspecies Amazona aestiva xanthopteryx, is present, albeit less markedly, also in the nominal species Amazona aestiva, therefore, after some authors, relying on this character while identifying a subspecies should be not justified. A frequent error, unluckily very often committed by the breeders and rightly criticized by the ornithological biologists, and by the undersigned, is that of discriminating the subspecies of the Blue-fronted Amazon, by referring to the extension and the yellow-red colouring of the belt marking the wing. However, nowadays, the International Commission for Zoological Nomenclature (ICZN), ascribes two subspecies to the Amazona aestiva, which are the Amazona aestiva aestiva and the already cited Amazona aestiva xanthopteryx, whose biology (ethology, ecology, reproductive biology, alimentary ecology, etc. ), is basically the same. 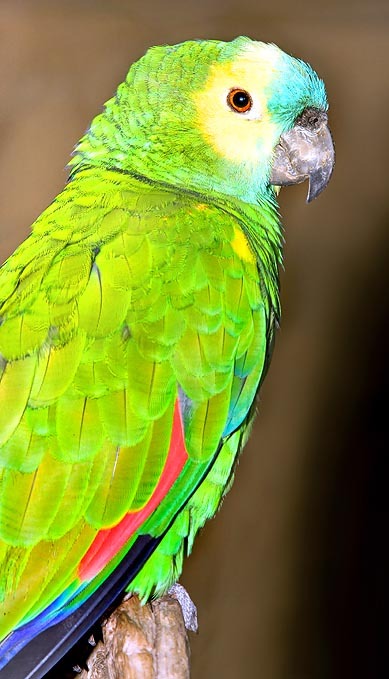 It should be noted that in Spanish and in English the common denomination is identical for the Amazona aestiva xanthopteryx, whilst in German it is called Gelbflügel-Blaustirnamazone, on the other hand, the subspecies Amazona aestiva aestiva, keeps the same common names of the nominal species in all above mentioned languages. 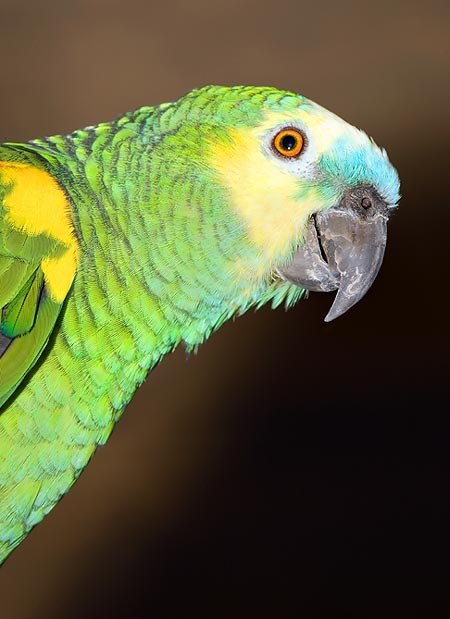 Both the nominal species Amazona aestiva, and the subspecies Amazona aestiva aestiva, do live in the northern part of South America, particularly in the eastern part of Brazil, from Maranhão to the south, south-eastern part of the Mato Grosso (until a few years ago, they were found also in the western part of the Rio Grande do Sul), in Guyana, Colombia and Venezuela, whilst the subspecies Amazona aestiva xanthopteryx is more localized in the southern portion of South America, in particular, in Argentina, Uruguay and Chile. In their distribution area, both the Amazona aestiva and the Amazona aestiva aestiva tend to localize in wet habitats and with tropical savannah, like those which characterize the vegetation of the Cerrado (an eco-geographic area of the tropical savannah Brazil), whilst the Amazona aestiva xanthopteryx, stands in the Argentinean Chaco prairies. The nominal species as well as the two subspecies, in the specific regions, have colonized also areas of pluvial forest, palms forests, open savannahs, prairies and cultivated areas. They may live up to 1600 m of altitude above sea level. Usually, the green is the main colour in the nominal species and the two subspecies. The feathers of the body are bordered with a slight black colouration, whilst the head has a variety of them. The front has a tuft of azure-blue feathers mixed with white ones, from which comes the common name blue-fronted. The feathers close to the eye, like those covering the ear and part of those covering the head (at times also those of the thighs), are yellow. The lower part of the cheeks and the chin are light blue, or yellow-grey. The yellow belt covering the wings may, at times, tend to the yellow-orange. In the subspecies Amazona aestiva xanthopteryx, as well as in the Amazona aestiva aestiva such belt may be more extended and wider, and the feathers may have also a more dispersed or scattered geometry. The border of the wings is of grey-yellow colour; the primary coverts have blue-violaceous extremities; the red speculum is formed by five flight feathers. The tail is grey, with yellowish-grey extremities. The base of the remiges is red. The periophthalmic skin varies from the whitish to the grey, the pupil is dark, the iris, orange; the zygodactylous feet are grey. 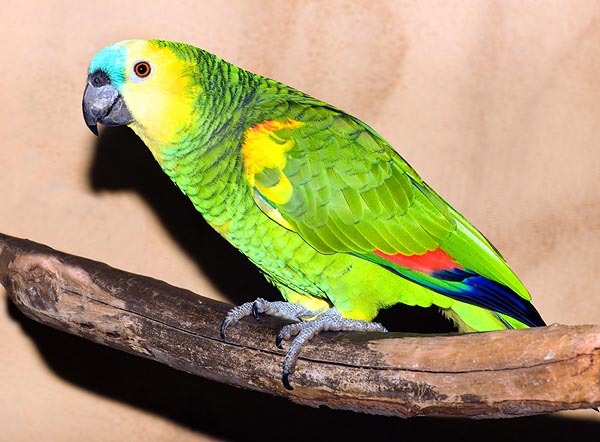 Their dark grey beak is smaller than in other species of Amazona and is shaped like a hook. Males and females do have neither characters of sexual dimorphism, nor seasonal or permanent, and are of the same size. They are about 37 cm long, weigh about 400 g, and may live up to 50-60 years when in the wild. They are rather common birds, even if in Argentina they are close to the risk of extinction, because entrapped and sold. The CITES, appendix II, sternly regulates its trade. 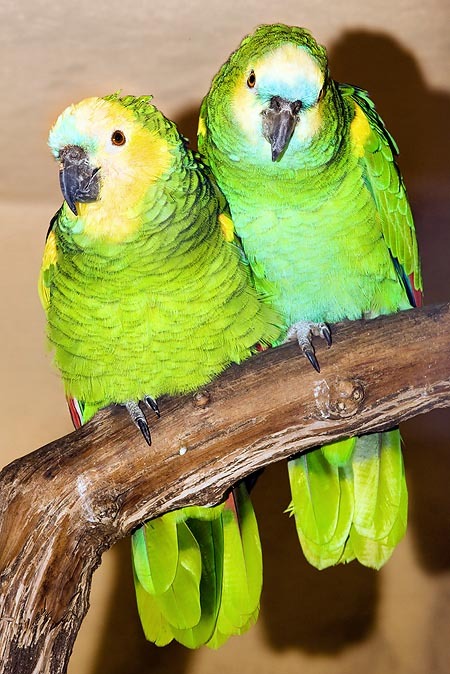 These birds may live in pairs or in small flocks; they have been seen in such combinations during their meals, on the roosts, or during the day flight as well as during the night rest. Both members of the nominal species and of the two subspecies are quite calm and silent; their presence may be often noted due to the food that falls on the ground. They are not shy and do not avoid the contact with the man. If scared, they quickly fly away shouting loudly; they are also well evident and noisy while flying, and have a hoarse and very noisy voice. The monogamous pairs may be observed always flying together and very close; at times, big flocks gather in the resting areas by the evening, intermingling with other species of the genus Amazona. Both the nominal species and the two subspecies are subject to seasonal migrations; this is a not very frequent biological phenomenon in the psittaciforms. For instance, the race Amazona aestiva xanthopteryx, present in Argentina, does migrate from the Chaco towards the hills east of Andes, between March and September. These parrots, during such migrations, often nourish in the cultivated lands, thus causing remarkable damages to the local countrymen. The members of the nominal species and of the two subspecies all do have a similar alimentary ecology: they are greedy of fruits of the genera Melia, Aspidosperma, Schinopsis, Ziziphus, Prosopis, cactus fruits, compound fruits of palm and also of seeds of the genera Anadenanthera, Citrus, Cercidium and Bulneria, as well as of nuts and flowers of the genera Erythrina and Morus, and of various buds. The mating season both in the wild and in captivity, stands from October to March. The nests are built by the males, on trees of the genera Aspidosperma, Melia, Prosopis, Schinopsis and Ziziphus, at heights of more than 9 m from the ground. It happens that the nests may by also built in the cracks of the termite mounds; the ornithological biologists have calculated the density of a nest per hectare, about 2,5 acres. Once built, the same nest, is not destroyed, may be utilized in the following deliveries. Usually, a female lays 3 eggs, but there may be instances where 1 to 5 eggs are laid. As an average, the eggs measure 3,81 x 2,96 cm. The incubation lasts, as an average, 26-27 days and the pullets are nourished for about 60 days before flying away.